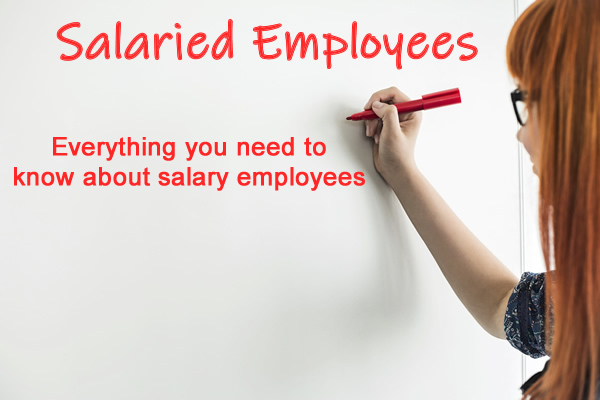 What is a Salaried Employee? April 15, 2019 - By OTC Team! A salaried employee is any employee that receives a predetermined compensation each pay period. Many employers choose this method to compensate their staff, but when is it right for you and in what circumstances are right to offer this to your employees? The Salary level test is to determine that your employee is making a minimum salary of $455 per week ($23,600 annually). This salary may not be the entire compensation that an employee receives, but can be utilized as a base with performance or goal based incentives, or additional flat sums that can be added to the payable amount based on things such as performance, goals or additional incentives. Some exemptions to this rule is if the employee role includes: outside sales, teachers or employees practicing medicine or law. Legislation was presented for review of a new compensation amount that was to go into effect but shortly after this was introduced multiple states filed grievances and suits against this change and as such no changes have yet been made. Salaried or exempt employee job descriptions must fall into certain categories in order to meet the duties test component of establishing if a salaried role is right for your employees. Title along is not sufficient to determine if an employee is eligible to receive this exempt status. According to Section 541.2 “A job title alone is insufficient to establish the exempt status of an employee. The exempt or nonexempt status of any particular employee must be determined on the basis of whether the employee’s salary and duties meet the requirements of the regulations in this part.” An employer must be careful to ensure that the employees that they are considering to be exempt are not deemed to be a blue collar, production line or non-management (and non-administrative) employees. Employee’s who are working in an non-managerial, but administrative capacity that directly impacts the general business operations, or directly impact the businesses of the customers’ that the business supports and is of a non-manual status would qualify under this heading; while in order to qualify as a Manager the individual would need to have at least two direct reports on a regular basis, have the ability to hire, fire, or whose suggestions have the opportunity to impact an employee status change in addition to additional managerial duties as well. Executive staff must be either in an executive level role, such as CEO or other high level role within your organization. Employees that fall into the professional category, such as: lawyers, doctors, nurses (not LPNs) or teachers must fall into either a creative or learned professional criteria that must be met. Other types of employees that can be included in this status are outside sales employees, who are directly responsible for FLSA determined sales or obtaining contracts or orders directly benefiting the business. Computer employees must be highly dependent on both computers and programs, and not limited to the repair or manufacturing of computers. Click here to identify additional fact sheets regarding each type of executive, administrative, professional, computer, and outside sales roles according to the FLSA. Sickness or disability are allowable, if following a plan. Labor costs are not able to be lowered, even if employee is working less hours due to decrease of labor needs. Employers are required to track and justify any deductions that have been made, and need to be careful to consider both volume and severity of deductions. In the event that an employer has made improper deductions, they could lose their exempt status and be required to pay employee under hourly classification. Now that we have determined the types of employees, and the criteria that make up these roles, you as a business owner and leader are able to examine how the status of exempt, or salaried employees would affect your business. While considering both benefits and downsides of this status, for both the business and its employees, you as an employer may ask “What is best for everyone?” and make the determination on a case by case basis while ensuring that the proper requirements and criteria are in place. To obtain additional information regarding the Department of Wage and Labor, as well as the Fair Labor Standards Act at: http://www.wagehour.dol.gov or by calling 1-866-4USWAGE (1-866-487-9243).